Summer is here and school’s almost out! Sparkles & Stretchmarks has teamed up with Cadbury to bring a little bit of joy to Mums and Teachers around the UK as the end of term approaches. One lucky winner will receive x10 boxes of Cadbury Thank You chocolates to help take the hassle out of what to buy for your child’s teachers! Bored of buying the same old mug and bunch of flowers for an end of year gift? A whopping 73% of Mums and Dads have less than an hour to spend on finding a gift and are stuck for inspiration, with a further one in five admitting to recycling abandoned presents! Cadbury Thank You boxes are the perfect present to send you straight to the top of the class. 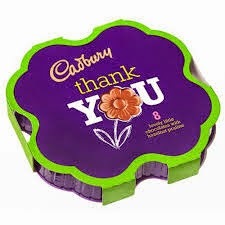 Filled with lovely little Cadbury chocolates with hazelnut praline in a flower shaped box, they are the ideal way to say ‘thank you’ to your child’s teachers for their year of hard work. Available from www.cadbury.co.uk, and most retailers: RRP £3.99 for 180g, or RRP £1.49 for 48g. What shaped box does Cadbury Thank You come in?